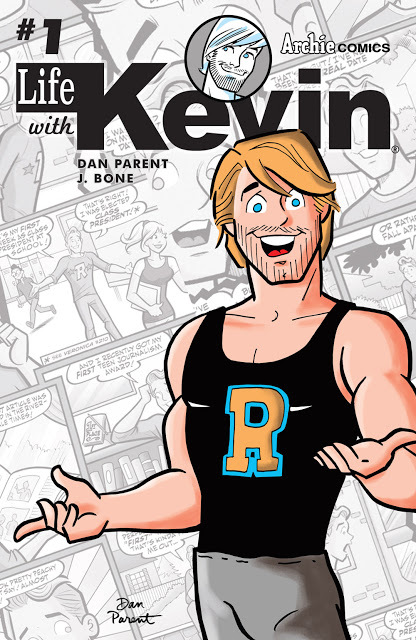 A great litmus test for potential friends or lovers is to get their reaction to Archie Comics' new 'Life with Kevin' series by Dan Parent and J. Bone. If they say a single negative word it's best to cut ties with them immediately as 'Life with Kevin' is an irresistibly fun life-in-the-city story that is guaranteed to put a smile on your face. Look, Parent treads familiar territory with a recent college grad landing a terrible apartment in New York, a thankless copy writing gig, while navigating the social landscape. All things we've seen before in television and film. What makes 'Life with Kevin' so endearing is Kevin himself. This is an Archie book so we expect a level of innocence and goofiness that's synonymous with the publisher but it's Kevin's unyielding optimism and resilience that is infectious and charming. Nothing stands in Kevin's way, he just rolls with the punches and with a smile on his face. Not even his skeptical family about his dreary new digs or his awful first day at a news station or the awkward flirtations of a potential mate in a neighbor slow Kevin down. It's similar ways to Unbreakable Kimmy Schmidt and New Girl, you can't keep your eyes off the lead character. You can't help but root for them. And more importantly, you rarely get this type of quality fun storytelling with a gay character much less as the main lead. It's enlightening to see Kevin have to try and decipher if his friendly and helpful neighbor Chris is gay or not. It's not something you'd normally have to contend with but it's part of Kevin's experience and now it's yours. Stories are a way to live through different people and their lives and gain an understanding you might not otherwise. Parent draws on a simple color scheme that makes the book unique and dreamy. His pencils are pure Archie house style with broad humor and exaggerated physical comedy. With only black, white, and blue to fill the panels, the emphasis is clearly Kevin's wide smile, stubbly face, and big shoulders. Kevin is the focal point obviously and it pays off. J. Bone adds considerable and essential depth and dimension with his inks. Not to be outdone though is everyone's favorite spoiled rich girl, Veronica Lodge, who makes an appearance as Kevin's best friend. Their camaraderie feels genuine and Veronica's unfulfilled life makes a nice contrast to Kevin's who is actively working on getting his dream job. We might be seeing more of this dynamic. 'Life with Kevin' may spin some familiar sit-com tropes but with a charming character like Kevin Keller it feels fresher than it should. It's a fun and engaging peek in the life of one of Riverdale's best getting out on his own after college reaching for his dreams, looking for love, and doing it all with confidence and optimism. How could you possibly hate that?